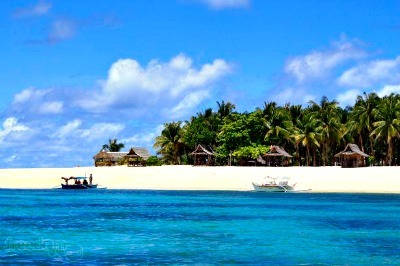 Daku Island, one of the three islands of Siargao, Surigao del Norte, is the next tourism hotspot in Mindanao. With an approximate area of 30 hectares, Daku Island is being developed by the local and provincial government in Surigao del Norte to be the next tourist destination in Siargao, a surfer's haven. "We envision Daku Island to become another Boracay in the country because of its strong potential for tourism industry," said Mayor Jaime Rusillon of General Luna. The island is gifted with white sand beaches and two surfing areas that are now being visited by surfers from the country and around the world. Rusillon said there is no doubt that Siargao Island is now among the foremost destinations of foreign and local tourists. The island, a gem of Surigao del Norte province is drawing thousands of visitors every year especially during Holy Week and the staging of two international sports in the country, the Siargao International Game Fishing Tournament and the Siargao International Surfing Cup. More than 7,000 visitors trooped to General Luna town this September alone to witness the ongoing 22nd Siargao International Surfing Cup which formally opened last Sept. 23 and will end on Sept. 29. Of the total number, more than 2,000 are foreign tourists, some of whom are professional surfers who will compete in said prestigious cup that will end on Sept. 29. Local and foreign tourists who visit General Luna every year do not leave the town without stepping into its three sought-after islets, namely the Naked Island, Daku Island and Guyam Island. Rusillon said Daku Island is one of the 19 barangays of General Luna populated by more or less 80 households. To equip the island with facilities that will cater to the needs of visitors, the provincial government of Surigao del Norte established last year a PHP3-million tourism center building. “We thank Governor Sol Matugas for the construction of this tourism center. Visitors to the island utilize this center as dining area and a place to rest for those who opt to stay overnight,” said Daku Island Barangay Captain Imelda Antipasado Gaña. Tourism development is among the priorities of Governor Matugas in Surigao del Norte especially in Siargao Island where the radars of fishing and surfing enthusiasts worldwide are geared to. But Daku Island is special, said Rusillon, adding that the place is considered as the stop-over of island hoppers from the Naked Island to eat, splash into its cool and clear waters and rest before proceeding to Guyam Island and then back to the mainland Siargao. Gaña said around 200 to 300 local and foreign visitors come to Daku Island everyday but the peak season of tourist arrival in the island happen every Holy Week when they cater around 1,000 visitors daily from the months of April to June. She said that aside from the tourism center, the island has also more than 30 cottages strategically situated along white sand beaches and are available for rent to visitors. There are tourists who bring with them tents and stay for a night in the island, while others just stay in the cottages and in the tourism center Gaña said. “They are safe here to stay. We always assure of their safety especially at night time,” she added. Daku Island now is being provided with 22 units of solar power street lights and one unit solar power charging system. The solar project with a total cost of PHP845,509 was implemented by the Department of Social Welfare and Development (DSWD) through its KALAHI-CIDDS program. A power generator, provided by the provincial government of Surigao del Norte is also helping the residents in the island. To further prepare Daku Island as the next tourism hub in the area, the Department of Energy (DOE) with the support of the provincial government and the first congressional district is set to implement a PHP36-million underwater cable project from the mainland Siargao. Rusillon said the project was already bidded out last January. “We are expecting the start of the construction of the project this year,” Rusillon said, adding that investors who are into hotel and restaurant businesses have already signified their intentions to pour in capital into Daku Island once supply of electricity in the area is stabilized. If the underwater cable is completed, Rusillon said Daku Island will source out its power and electricity from the Siargao Electric Cooperative or SIARELCO. Rusillon said that Daku Island is also home to the biggest fish sanctuary in CARAGA region (Region XIII) that continue to provide livelihood and support to hundreds of fisherfolk living in the area. The mayor said that the fish sanctuary has a total area of 580 hectares that was developed and funded by the Bureau of Fisheries and Aquatic Resources (BFAR) with the support of the local and provincial governments. “Maayo kay nay fish sanctuary nga moseguro sa among panginabuhian (It is good that there is that fish sanctuary that assures us of our livelihood),” said 60-year old fisherman Eduardo Cometa. Cometa said he has been fishing around Daku Island for nearly 40 years now. Catch varies every day, Cometa added, as he expressed gratitude to the municipal and provincial leaders for the support they provided to the fisherfolk of Daku Island. Gaña also testified that the supply of fish and other marine products in Daku Island are still abundant. To maintain such abundance, the local government is also intensifying its campaign against illegal fishing particularly the use of dynamite.